If what Mr. Zuesse is writing, in the following, seemingly very well substantiated article, is true, then extremely serious questions arise as to which forces have helped Mr. Trump become the President in a country where anybody who challenged the establishment got assasinated (for ex. the Kennedies) and which forces are controlling him. Another extraordinary aspect of all that is also the way such forces have succeeded, up to now, to be hidden behind Russia! If things like those already revealed are true, then the same forces controlling Mr. Trump can use the situation they helped engineer, to push him to implement their war agenda against both Iran and North Korea, in exchange for help to the President to get out of all this mess. If Mr. Trump will not agree to the war scenarios, then more disturbing revelations may follow. We hope that all these are simple suppositions and hypotheses, theories of conspiracies and not description of real conspiracies. But, unfortunately, nightmares tend now to happen more often when we wake up, than when we slip. Maybe this is a reason we slip too much. The Special Counsel Robert Mueller’s main evidence thus far in his “Russiagate” probe is not actually about possible Russian collusion with Trump to win the Presidency, but instead about definite Israeli collusion with Trump after Trump had already won the Presidency but before he became inaugurated. As a lawyer explained on the day when Trump’s former National Security Advisor Michael Flynn was indicted in a plea-deal: “Mr. 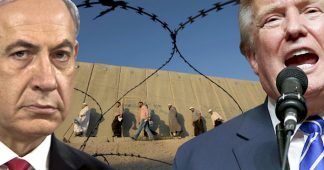 Flynn has just become the prosecution’s star witness.” What Flynn had pled to was his trying to obtain Russia’s support for Israel’s Government, against the Palestinians. Russia said no; Putin said no to Flynn’s request, which had been made on behalf of Israel. 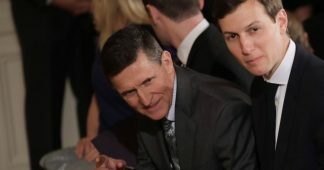 The way that Mueller’s investigation, to find reasons for Trump’s impeachment, achieved on December 1st the indictment and plea-deal with Flynn, was to get Flynn to admit (after his first having lied to deny) that he had been asked by Trump’s son-in-law Jared Kushner, who had been asked by Israel’s prime minister Benjamin Netanyahu, to communicate to Russia’s head-of-state Vladimir Putin through Russia’s U.S. Ambassador, a request on behalf of the incoming U.S. Administration of Donald Trump, for Russia to get Israel out of a jam at the U.N. Security Council. Netanyahu didn’t want to be alone in trying to pressure Putin to turn against the Palestinians; he wanted the incoming Trump Administration also to be pressuring Putin to do that — for Russia to veto, this time, a resolution (#2334 in 2016), which, every year in the past, had been supported by Russia; or, failing to achieve that, to get Russia’s support for Israel’s effort to delay the Security Council’s vote, until after Trump would become installed as the U.S. President on January 20th. That’s what Putin was saying no to. Furthermore, Putin’s answer to Kushner’s request for Russia to veto or at least delay the “United Nations Security Council resolution condemning Israel for its settlement policy” was the exact opposite of what Netanyahu-Kushner were requesting: Russia voted in favor of the resolution, not weakened it — much less vetoed it, as Netanyahu-Kushner were urging. In other words: Russia refused to comply with the incoming U.S. President’s son-in-law’s request that had been passed to Putin through Russia’s U.S. Ambassador Sergey Kislyak, through Flynn, through Kushner, who had received the request directly from Netanyahu (and the indictment makes no allegation that President-Elect Trump even so much as knew about any of this; there is no impeachable allegation made there against Trump). Possibly, but not yet certainly, Kushner had received, from his father-in-law, instructions to comply with Israel’s ‘requests’, so that Kushner didn’t need to communicate with Mr. Trump specifically for permission to pass along to Putin through Russia’s U.S. Ambassador, Netanyahu’s desire, as being also America’s desire. Not only was Trump not Putin’s agent in this matter, but his son-in-law was instead serving there as Netanyahu’s agent, under some as-yet-undetermined authorization from Trump, but the indictment doesn’t even allege there to have been any such authorization, by Trump, at all. We can be certain that Kushner did have Trump’s authorization, however, in some form, because even now, Trump hasn’t yet fired Kushner. Kushner’s incompetence might bring down Trump, but Trump still stands with Kushner, against Mueller, even though that seems politically suicidal for Trump to be doing. No doubt, if Trump were to break from Kushner, then Kushner might testify against Trump — and so that path (Trump’s turning against Kushner) would also be politically suicidal for Trump. Perhaps Kushner will go to prison if he becomes prosecuted and doesn’t reach any plea-deal. Maybe that’s the reason why Trump doesn’t fire Kushner. The plea-deal with Flynn has him admitting that his contacts with Kislyak were authorized only by Kushner (referred to in Flynn’s indictment not by name but only by the vague phrase “a very senior member of the Presidential Transition Team”). 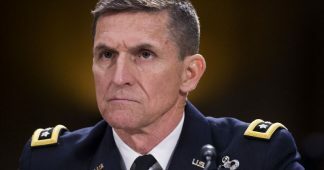 However, Flynn had earlier lied to the FBI and said that he “never asked Russia’s ambassador to Washington, Sergey Kislyak, to delay the vote for the U.N. Security Council resolution.” So: if, subsequently, it somehow does turn out to be Flynn’s word against Trump’s word, then the ultimate decision will be made by Senate Republicans when they either do or don’t vote for Mike Pence to take over the remainder of Trump’s term. In order for that switch to be made, two-thirds of the entire U.S. Senate — that’s 67 of the 100 — would need to vote for Pence to take over. Whereas Democrats seem eager for Pence to complete Trump’s term, that’s only 46 Senators, or 48 if both Independents vote with the Democrats, and at least 9 or 11 of the Senate’s 52 Republicans would then also need to vote for Pence. The Vice President would not be the presiding officer; instead, the Constitution makes the Chief Justice of the U.S. that, and only the Senators are allowed to be counted in a Senate trial that would follow after the House’s majority-vote for a Senate trial to be held. The V.P. couldn’t serve as any ‘tie-breaker’ in this trial. And removal-from-office would be the only direct harm to Trump; the U.S. provides no way to try the President on any charge via the courts — the only way a U.S. President can be punished for any crime is by being tried, and then convicted and removed from office, by a two-thirds vote in the Senate. Other than that, a U.S. President is above the law. 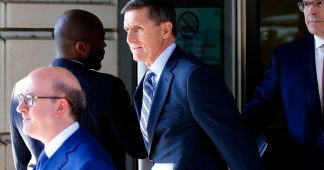 Flynn admitted now that that was a lie — that he had made this request of Kislyak. Apparently, exposing Israeli control over the U.S. Government is, in effect, prohibited; only Russian ‘control’ over us may be ‘exposed’. 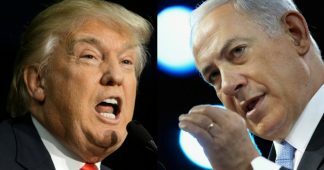 The very possibility, that when America’s taxpayers pay (via U.S. taxes) annual donations of $3.8 billion per year to the Government of Israel, which is a ‘friend’, instead of a master — an enemy — of the American people, seems to be prohibited to disprove, or even to question publicly. But there it is, and Russia gets the blame, which Israel (and the Sauds) do not. * Investigative historian Eric Zuesse is the author, most recently, of They’re Not Even Close: The Democratic vs. Republican Economic Records, 1910-2010, and of CHRIST’S VENTRILOQUISTS: The Event that Created Christianity. 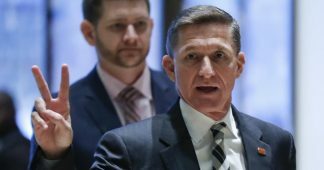 Flynn – the latest victim of the Obama-Netanyahu war?